The following is a list of the shortest male tennis players that I am aware of and know about. If anybody knows of a shorter professional tennis player please leave a comment. The average height of a man in the United States today is 5' 9 1/2". As you can see below all the pro tennis players on this list are much shorter than that. Is it a disadvantage in tennis to be short? The answer is yes absolutely. It is far easier for a tall player to hit the ball over the net with great force while serving than it is for a shorter player. Serving is a huge part of tennis. 1. Felicisimo Ampon - 4' 11"
At a height of just 4' 11", Felicisimo Ampon is the shortest professional tennis player of all-time. Ampon was born in the Philippines on October 27, 1920. His father was also a pro tennis player and his sister Desiderio was one of the best women players in Asia in her time. Despite his short height, Felicisimo Ampon was a pretty good tennis player. He reached the quarterfinals at the French Open in both 1952 and 1953 and made the 4th round at the U.S. Open four times. Ampon won 25 tennis tournaments in his career and he won 40 Davis Cup matches playing for the Philippines. Felicisimo Ampon passed away on October 7, 1997, at the age of 76. 2. Olivier Rochus - 5' 6"
Olivier Rochus is a retired tennis player from Belgium who stands 5' 6" tall. Olivier is a Grand Slam champion as he won the 2004 French Open doubles title, In singles play, his best showing in a Grand Slam was the 4th round at the Australian Open, Wimbledon and the U.S. Open. He retired having won two singles and two doubles titles on the ATP circuit and his career earnings are $4.8 million. T-3. Bobby Riggs - 5' 7"
Mainly remembered for his world famous "Battle of Sexes" match vs Billie Jean King in 1973 that was televised on live TV to enormous ratings, Bobby Riggs was a great tennis player in his prime. 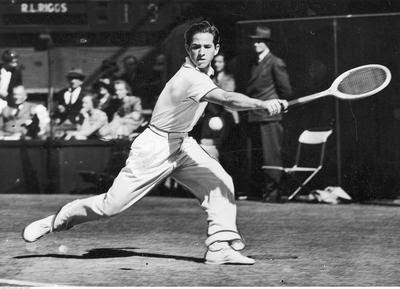 He won Wimbledon in 1939 and the U.S. Open in 1939 and 1941 in singles play. Riggs also won Wimbledon in 1939 in doubles and mixed doubles play and the U.S. Open in mixed doubles in 1940. So Bobby Riggs was a six time Grand Slam tennis champion. Riggs was also a big-time gambler who won the equivalent of $1.8 million in today's dollars betting on himself to win all three events (singles, doubles, mixed doubles) at Wimbledon in 1939. T-3. Yoshihito Nishioka - 5' 7"
Yoshihito Nishioka is a 22 year old tennis player from Japan who is 5' 7" tall. Yoshi has made the second round in singles play at both the Australian Open and U.S. Open so far in his career. His career earnings are approaching $1 million. T-3. Diego Schwartzman - 5' 7"
Diego Schwartzman is a 25 year old tennis player from Argentina. Diego made the quarterfinals at the 2017 U.S. Open in singles play which is his best showing to date at a Grand Slam event. Diego has earned over $3 million so far in his career. 6. Rod Laver - 5' 8"
The best shortest tennis player of all-time is Rod Laver who is 5' 8" tall. Rod Laver won 11 Grand Slam singles titles in his career and he completed the Grand Slam in tennis in both 1962 and 1969 winning all four events in a single calendar year. You can't get any better than that.